Having exercised intensely, you have to take care of your muscles, but some athletes forget about that important issue! Some of them take a lot of supplements to get their muscles they strive for and body they want, but then, they skip the regeneration step which is very important. Dianabol is the very supplement you need for regeneration! You can burn a lot of fat and preserve your muscle gains, taking the supplement with herbal extracts! 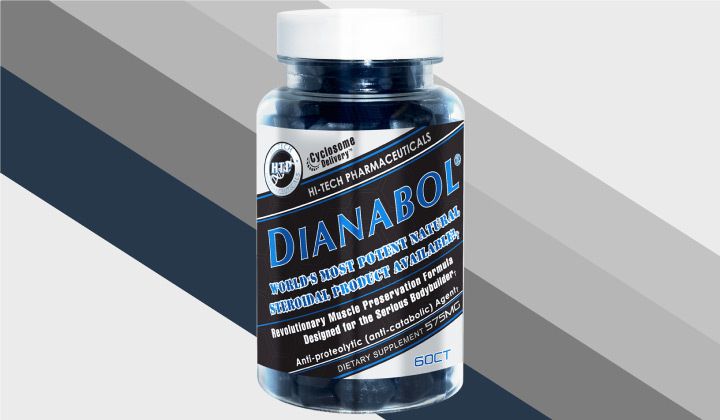 We are happy to introduce Hi-Tech Pharmaceuticals Dianabol to you! How Does Hi-Tech Dianabol Work? Hi-Tech Pharmaceuticals presents a formula containing natural herbal extracts and anti-proteolytics in its product called Dianabol. It will help bodybuilders to burn fat, preserve muscles gained, and build new ones! The supplement will promote testosterone release and ensure your enhanced performance in the gym. Dianabol is a perfect tablet containing a unique blend of natural plant-based steroids. Dianabol works perfectly because it has a unique blend of 100% natural anti-catabolic steroids. This feature makes this supplement one of the most efficient bodybuilding support you can find nowadays. Each tablet contains 575 mg of the ingredients listed further on: 1-Andro, 4-Andro, Androsterone acetate, DHEA, Ipriflavone, Methoxy, Ecdy Bolin, Rostanabol, Laxogenin, Diosterol, and finally, Androsterone. The compounds 1-Andro and 4-Andro are also called 3β-Hydroxy-1,4-androstadien-17-one. They are among the most popular anabolic compounds currently known. They assist in preserving the muscle mass gained after your cycle. However, there is a small chance of estrogen release, so we recommend taking some dedicated supplement to counter its effects. 3β-hydroxyandrost-5-en-17-one is prohormone as well. It converts to testosterone. In its turn, it ensures less water retention in your body, so, your muscles remain firm. The compound is androgenic. Consequently, due to the higher aggression in the gym, you will feel more strength and power. 3β-Acetoxy-5-androsten-17-one, otherwise known as Prasterone Acetate, is an ester of natural steroids released in your body! The steroids are secreted in the adrenal glands, and after that, they turn into androgens and testosterone. The substances promote metabolism processes and energy boost! 5-methyl-7-methoxy-isoflavone or Methoxy is an anabolic compound which boosts protein synthesis to its maximum. Due to this process, more nutrients are delivered to your muscles and protein breaks down faster facilitating your muscles gains and allowing them to steadily grow strong. The compound is a non-steroid anabolic as well. Therefore, you may leave all your fears about side effects behind as it produces the same effects as steroids. 7-Isopropoxyisoflavone or Ipriflavone is like Methoxy which promotes protein synthesis. The compound assists you in getting rid of your body fat, and at the same time, increases your endurance in exercise, raising your body’s ability to efficiently use oxygen. Laxogenin is a mighty compound helping your body to create its natural testosterone! It helps to keep cortisol levels in check as well. The compound reduces recovery time and increases protein synthesis. 25R, spirostan-5a-diol-6-one-3-one or Ecdy Bolin is a compound of the Russian origin. It is actually a plant extract. It is able to turn on many anabolic properties which, in their turn, help you lose body fat and grow lean muscles due to nitrogen retention. 3 tablets are to be taken each day with your meals. A single bottle will suffice for 20 days. It’s very important to take Dianabol along with food. Otherwise, it may cause nausea if taken on an empty stomach. You might be interested in: 1-Testosterone 1-Andro (60CT) by Hi-Tech Pharmaceuticals – Our Choice!